“Candy, Crakerjack, Ice Cream, Chocolate !”... DANGER ! Remember this jingle from way back when? Unfortunately, all of these delicious treats are off limits to pets. But imagine a much worse situation that would mark us for life: our pet’s death due to chocolate ingestion! Chocolate is partly composed of cocoa, which contains theobromine. The darker the chocolate, the more theobromine it contains. From the Greek word theobroma or “Food for the gods”, theobromine is toxic for animals and has serious effects on many organs: heart, blood vessels, lungs, kidneys, brain. Contrary to humans, animals metabolize this molecule slowly and it can poison them quickly. 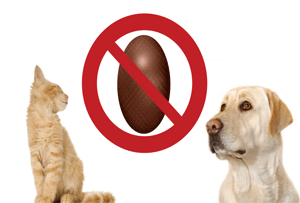 Therefore, always check the cocoa content of a chocolate treat, candy or cake and never give it to your animal. When Holidays roll around, like Easter, what could be better than savouring a dark chocolate rabbit, a milk chocolate bear or a white chocolate frog? Imagine that your pet then begs for chocolate with pitiful eyes and you give in by offering him a bunny ear. Here’s what happens. If your pet develops even one of these symptoms, call your veterinarian immediately. There is a chance he will make it…on the condition that you act very quickly after this unfortunate ingestion. So, instead of chocolate, treat your pet to some nice walks or play with him. Happy Holidays to everyone!